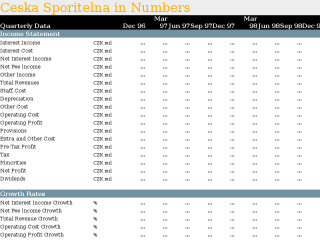 This Quarterly statistical dossier offers a summary of Ceska Sporitelna's performance between Dec 96 and Sep 18 on an quarterly basis. The report can be downloaded as an excel file. In addition, the excel file provides a detailed overview of the bank's market position in comparison with the overall banking sector. You can, for example, track CS's market position in mortgage or consumer lending. 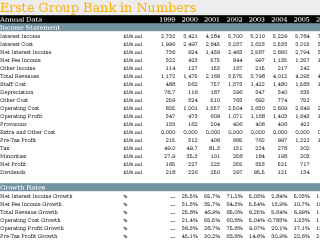 This Annual Statistical Dossier offers a comparison of 15 banks from Erste Group from 1996 to 2017 on an annual basis. The report can be downloaded as an Excel file. This Annual statistical dossier offers a summary of Ceska Sporitelna's performance between 1998 and 2017 on an annual basis. The report can be downloaded as an excel file. 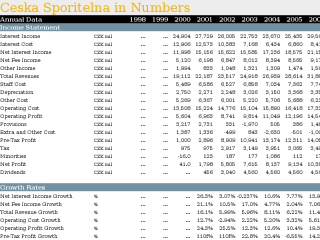 This Statistical Dossier offers a summary of Ceska Sporitelna's performance between 2000 and 2015, both on a quarterly as well as an annual basis. 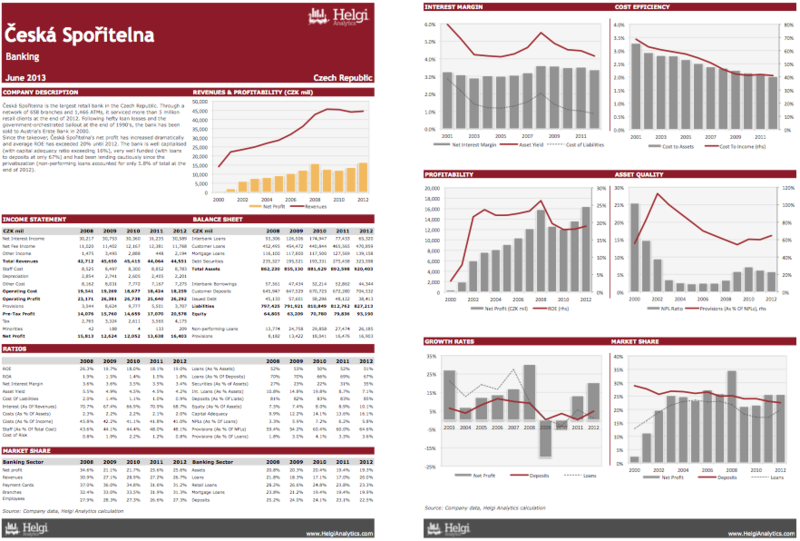 The report can be downloaded in Excel file format. You will find here all the key numbers from the bank's balance sheet, income statement and the main ratios related to the bank's business such as asset quality, capital ratios, number and cost of employees or a detailed breakdown of some of the Bank's businesses such as its loan portfolio. In addition, the Excel file provides a detailed overview of the bank's market position in comparison with the overall banking sector. You can, for example, track CS's market position in mortgage or consumer lending. Spořitelna's 3Q14 profit grows nearly 4% yoy..
Weak momentum remains the biggest worry for Česká spořitelna in our view. The bank's loan book grows more slowly than the market while deposits have been falling in absolute terms this year. While deposit growth is partly a result of accounting changes (reclassification of pension fund deposits), the weak lending growth is truly disappointing. That is especially the case as most of the market growth comes from retail, the area in which Spořitelna has been historically strong. In the last two quarters, for example, Spořitelna sold fewer mortgages than the more corporate-oriented Komerční banka (both in volume of loans as well as number of mortgages). Not that the bank suffers from a lack of capital or funding. With capital adequacy exceeding 18% and loans accounting for 73% of deposits only, the bank is well positioned to grow faster. The conservative approach of the bank is partly reflected in asset quality developement. The volume of non-performing loans dropped by more than CZK 3.5 bil. 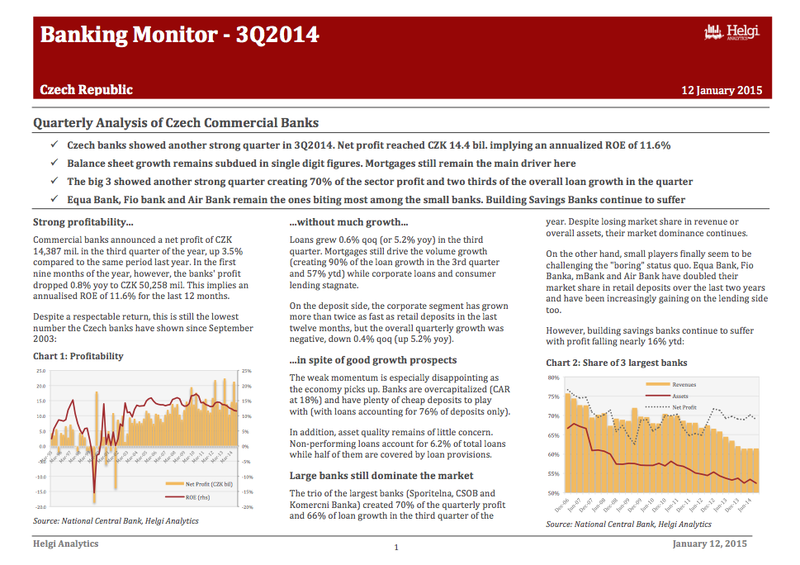 in the last twelve months - the highest among Czech banks. In addition, Česká spořitelna's provision coverage of 80% (of NPLs) is the second highest on the market (just behind Air Bank). Stavební Spořitelna České Spořitelny is the third largest building savings bank in the Czech Republic in terms of assets. Once the second largest building savings bank on the market (with a share of nearly 19% of lending in 2008), the subsidiary of Česká Spořitelna has been losing its position in housing lending as part of the overall strategy of Česká Spořitelna to retreat from the area of housing finance. At the end of 2012, the bank held only 13.4% of the lending market compared to impressive 22% of he market on the deposit side. Until 2011, Stavební Spořitelna České Spořitelny had been the most profitable (measured by ROE) and the best capitalised (by capital adequacy ratio) building savings bank on the market. Česká Spořitelna is the largest retail bank in the Czech Republic. Through a network of 658 branches and 1,466 ATMs, it serviced more than 5 million retail clients at the end of 2012. Following hefty loan losses and a government-orchestrated bailout at the end of the 1990s, the bank was sold to Austria's Erste Bank in 2000. Since the takeover, Česká Spořitelna's net profit has increased dramatically and the average ROE exceeded 20% until 2012. The bank is well capitalised (with a capital adequacy ratio exceeding 16%) and very well funded (with loans to deposits at only 67%) and has been lending cautiously since its privatisation (non-performing loans accounted for only 5.8% of total at the end of 2012). Česká Spořitelna remains a flagship of Erste Bank Group contributing more than a third the group's total profit. 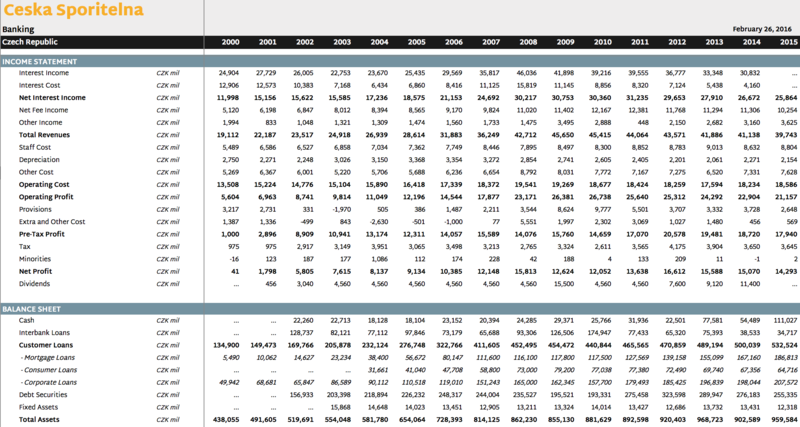 This report offers a summary of the bank's performance in 2000-2012. You will find here all the key numbers from the bank's balance sheet, income statement and main ratios related to the bank's business. Since the takeover, Česká Spořitelna's net profit has increased dramatically and the average ROE exceeded 20% until 2012. The bank is well capitalised (with a capital adequacy ratio exceeding 16%) and very well funded (with loans to deposits at only 67%) and has been lending cautiously since its privatisation (non-performing loans accounted for only 5.8% of total at the end of 2012). This excel file offers a summary of the company's performance in between 1Q2000-1Q2013, both on the quarterly as well as the annual basis. You will find here all the key numbers from the bank's balance sheet, income statement and main ratios related to the bank's business. 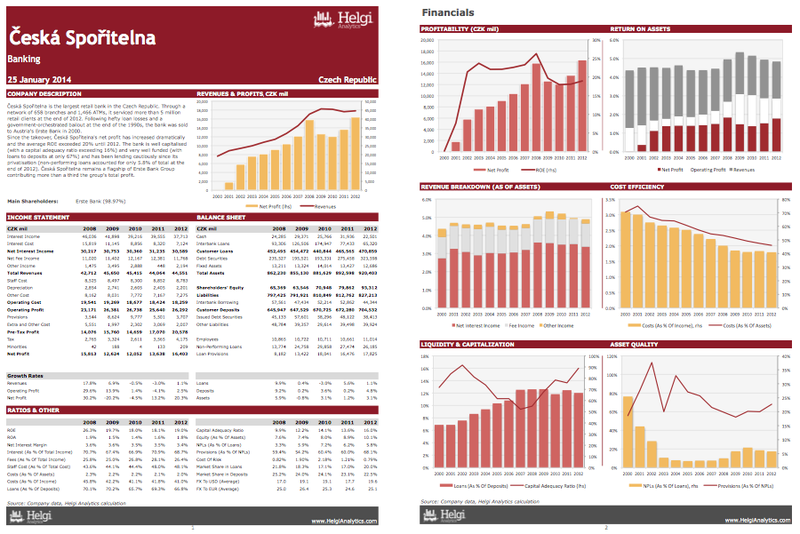 In addition, the file provides a detailed overview of the bank's market position in the comparison with the overall banking sector. 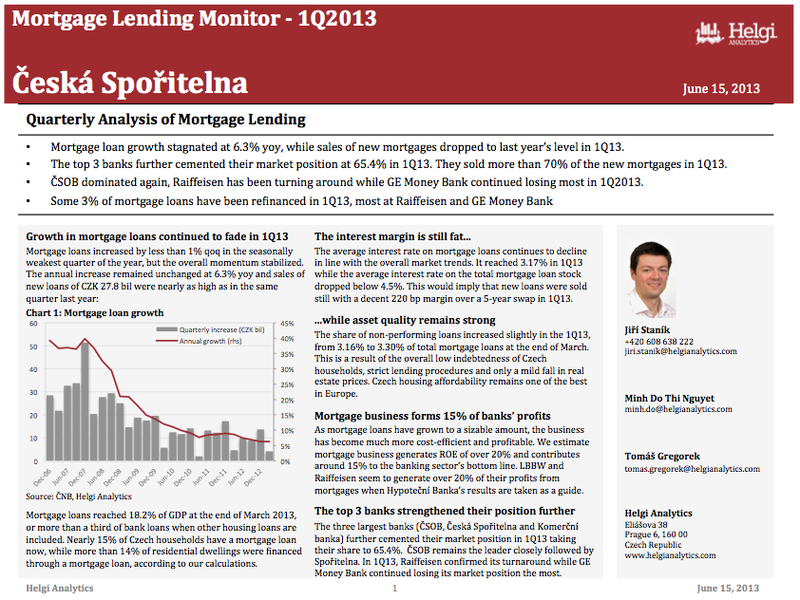 Česká Spořitelna’s mortgage loans increased 1.9% qoq and 8.4% yoy in 1Q13, slightly more than the overall market. On the other hand, the loans provided by Spořitelna’s building society dropped further 1.7% qoq and 4.5% yoy. Following the relatively weak years 2008-2010, Česká Spořitelna started gaining market share in 2011. 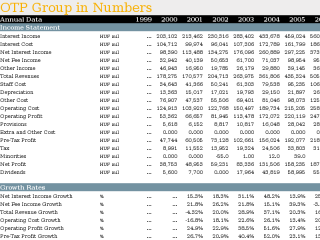 In 2012, the bank grabbed nearly 28% of the annual increase in the mortgage loan book. The positive trend continued in 1Q13 and Spořitelna crossed 20% threshold in March in terms of market share, according to our calculations. The bank is clearly benefiting from its superior funding and capital position when compared to the smaller players. In terms of new production, Spořitelna was nearly as aggressive as ČSOB in the last two quarters, selling 28% of all new loans. Mortgage lending – 12% of Spořitelna’s profit? Mortgage loans represented 30.1% of Spořitelna’s total loans at the end of March 2013. 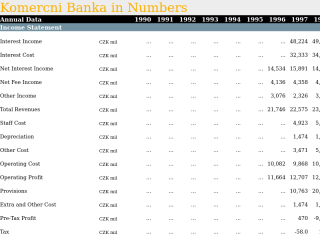 That is up from the figure of 9% seen a decade ago and at a very similar level compared to Komerční Banka, for example. The massive growth in volumes made a difference to the bottom line of the bank. 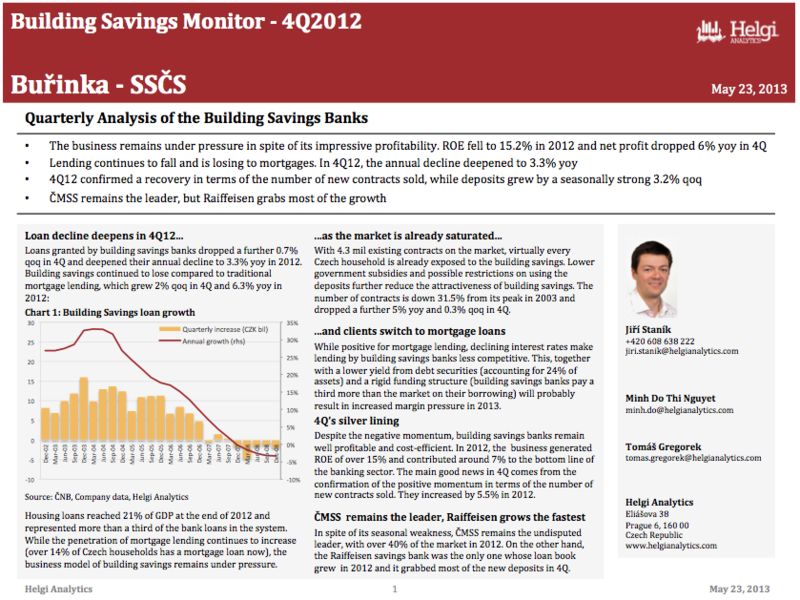 When Hypoteční banka’s financials are taken as a benchmark (for more details see page 9), we believe the mortgage lending business generates around 12-13% of Česká Spořitelna’s overall profitability now. 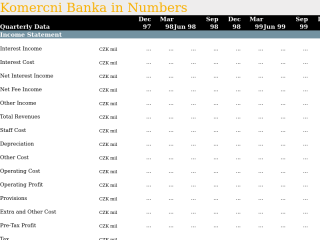 This is less than the 24% of Raiffeisenbank and 20% of ČSOB and also less than the 14% we estimate for Komerční Banka. Apart from the relatively stronger position of ČSOB in mortgage lending (with a 26% share of the market versus the 20% share of Spořitelna), Česká Spořitelna is benefiting from stronger profitability elsewhere (such as on its cheaper deposit base). Stavební Spořitelna České Spořitelny (also called Buřinka, a bowler) is the third largest building savings bank in terms of assets. Once the second largest building savings bank on the market (with a share of nearly 19% of lending in 2008), the subsidiary of Česká Spořitelna has been losing its position in housing lending as part of the overall strategy of Česká Spořitelna to retreat from the area of housing finance. 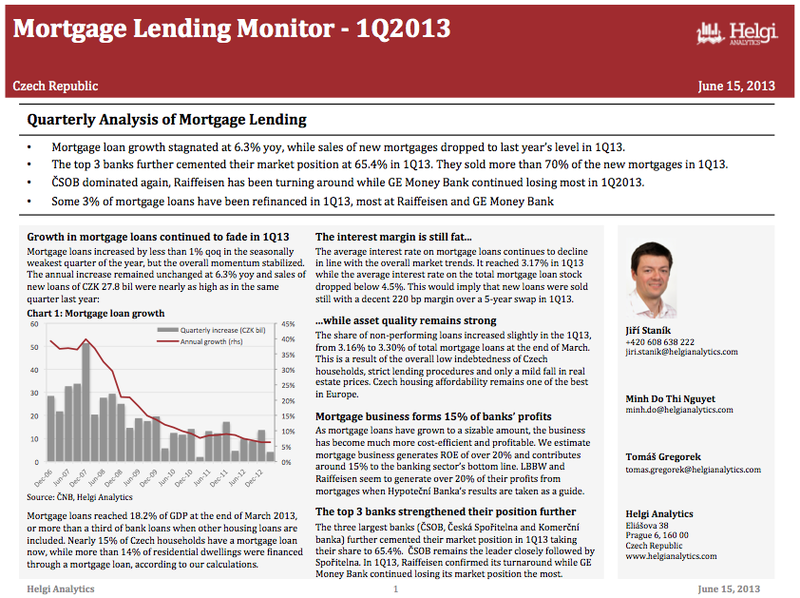 At the end of 2012, the bank held only 13.4% of the lending market. The bank therefore gave up a further 32 bp of its market share during the year; however, 4Q suggests a stabilisation of the bank’s position (flat qoq). 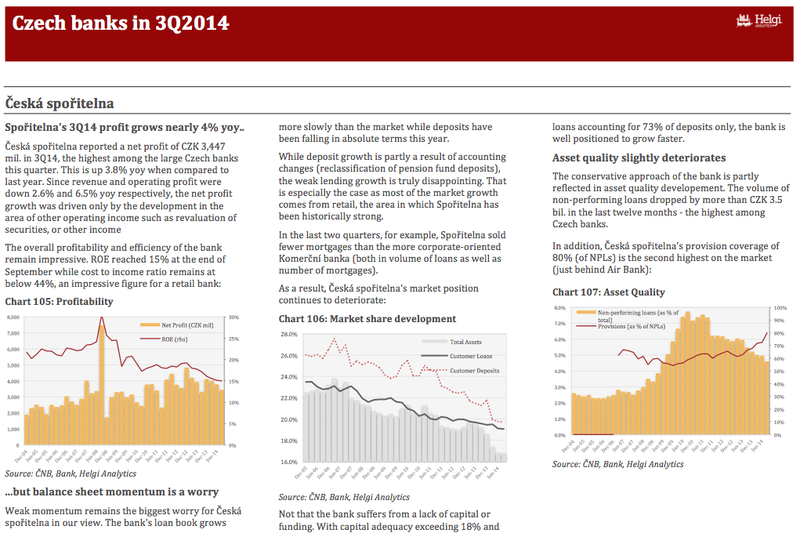 On the deposit market, the bank still maintains an impressive 22% share, up 22 bp qoq but down 6 bp in 2012. Because of the market’s slowdown and its weakening market position, the bank’s overall balance sheet momentum remains negative. Loans declined by a further 0.8% qoq in the last quarter and the full-year decline reached 5.6% yoy, while overall deposits increased 2.6% in 4Q, but dropped 0.3% in 2012. Until 2011, Stavební Spořitelna České Spořitelny had been the most profitable (measured by ROE) and the best capitalised (by capital adequacy ratio) building savings bank on the market. However, despite the negative momentum the bank is facing and the fact that the bank’s net profit dropped 23% yoy in 2012, the bank still achieved an impressive ROE of 15.7% in 2012! This is a remarkable achievement given the fact that the bank’s capital adequacy has been exceeding 17%. When adjusted for a surplus of capital (when ROE is adjusted to the building savings market average for each bank), Stavební Spořitelna České Spořitelny is still the third most profitable one on the market. Buřinka’s numbers are especially impressive on the cost side, which we describe on the right. This might be a result of accounting, rather than of real efficiency. Asset quality remains one of the weakest links of the bank. Non-performing loans rose CZK 79 mil, or 4.8%, in 4Q, the most on the market, and reached 4.13% of total loans (up from 3.72% at the end of 2011), which is the worst result within building savings banks. Provision coverage remains relatively weak at nearly 52%, compared to the 53% of the market. Stavební Spořitelna České Spořitelny has been running its business 40-50% more efficiently than the rest of the market when measured by its costs-to-assets ratio in recent years. In 2012, the bank‘s operating costs amounted to 0.45% of average assets. compared to the 0.73% achieved by the market. However good and efficient the bank is, we believe it has more to do with internal cost allocation within the Česká Spořitelna group, rather than with Buřinka’s underlying efficiency. Anyway, this, together with loan book development, are the main things to watch for here.